Smokin' Hot's color is described as "Dark orange overlaid with purple smoke and a white reverse." Blooms are 3.5-4 inches in diameter with 25-30 petals. Upright and vigorous bush. 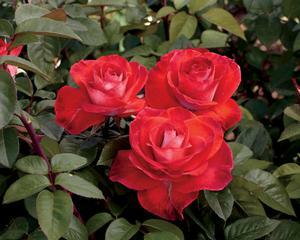 In California probably to 5 ft.
Blooms are born singly on long stems according to the grower.